Alda Merino-Caan, a law student with Loyola Law School’s Immigrant Justice Clinic. In communities across the country, our immigrant neighbors are living with the heightened fear that the lives they have built here will be destroyed, their families will be traumatically torn apart and the contributions they have made to our shared prosperity will be lost. Here in Los Angeles County, home to more than 3.5 million foreign-born Angelenos, the devastating effects of increased deportation enforcement have crippled our communities – something Alda Merino-Caan sees first-hand. 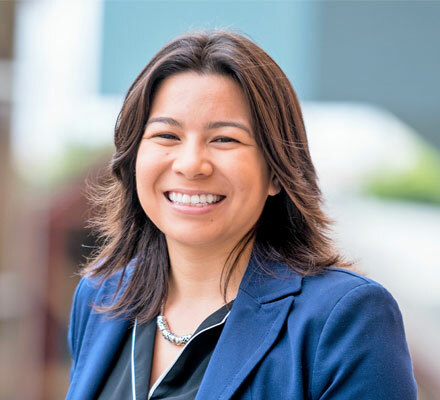 She is a student at Loyola Law School’s Immigrant Justice Clinic where they offer trainings and workshops through the L.A. Justice Fund (LAJF) to help strengthen Los Angeles’ network of immigration law defenders. The LAJF is a collaborative effort, supported by Los Angeles County, the City of Los Angeles, the Weingart Foundation and the California Community Foundation (CCF), to help more Angelenos and their families access legal representation and reinforce a safety net that is pro-family, pro-economic growth and pro-civil and human rights. Two months into her last semester of law school and fresh off an externship with another LAJF partner organization, Immigrant Defenders Law Center, Alda shares with us how her experience has shaped her view of the immigrant rights movement, as well as her own future. Question: Why are you interested in immigration legal defense? Alda: Before law school, I was a community organizer in the Los Angeles County area for three years and I worked closely with the immigrant population, mostly Hispanic and African migrants. We did a lot of social change projects in the community but the closer I became to the residents that I was working with, the more we would talk about their experiences as immigrants. Because they’d built trust with me, they would ask me legal questions and I had no idea how to answer. Even if I did, I did not want to give them the wrong advice. I decided to start law school, basically to get this legal information and figure out a way to disseminate it back to the people I was working with. I promised myself that I would at least know the basics of immigration law. So that’s where I’ve been this year, at Loyola Law School, focusing on immigration law and working at the clinic. I also worked with the Immigrant Defenders Law Center last semester. It’s a way for me to gain knowledge so I can give back. Question: How did Loyola Immigrant Justice Clinic connect you with Immigrant Defenders Law Center for your externship? Alda: I had heard of some of the other L.A. Justice Fund organizations but Emily Robinson, Co-Director of Loyola’s Immigrant Justice Clinic and Kayleen Hartman, a Supervising Attorney and Clinical Teaching Fellow at the Clinic, were the masterminds of the whole thing. They created a Removal Defense Practicum Course at Loyola that had an externship program, allowing students to be placed with other LAJF organizations. 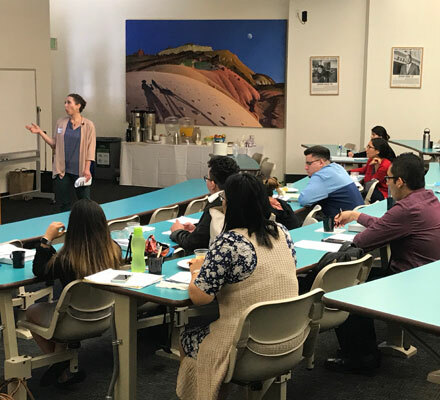 There’s a huge network forming among the immigration legal service providers here in L.A. There’s constant trainings, webinars and conferences. It’s not a perfect system but at least you see a lot of the L.A. nonprofits working together to have a concerted effort to address detained immigrants. Loyola Law students participate in removal defense trainings. Question: What was your experience like as an extern? Alda: I was able to wear a lot of hats, including researching and drafting motions, discussing constitutional questions, as well as understanding the full scope of the fourth amendment and what it can do to protect immigrants. I was also able to do a number of client interviews with detainees at Adelanto Detention Center. I represented one of them in their master calendar and bond hearings. For me it was really important to get that holistic approach and to see an individual for being an individual and not just the client. I know in certain parts of law, you kind of get the story and get the facts, and then you don’t really talk to the client much. My experience was completely opposite as an extern for Immigrant Defenders. I was able to keep in contact with them and their families. Not only to update them but also to be able to collect documents which the client depends on a lot because they likely will not have access to the documents. Question: What is it like to be inside of a detention center? What kinds of things did you see and hear from clients? Alda: It kind of reminded me of those hospital florescent bright lights, you know the constant 24 hour brightness. To my knowledge, the detained individuals are only allowed to be outside in a limited, fenced in area, except to go into a courtroom. Inside the courtroom, most of the clients go unrepresented and a lot of times you get a group being tried at the same time. I recently went to a facility and saw a group of young males, some of them looked like teenagers. The judge usually speaks through a translator and will go down the line and say to each one “okay, are you ready to talk about your bond?” So the translator is basically translating these messages wholesale to the group. They’re often without representation and all of the responsibility and burden is truly on the immigrants who usually have a limited understanding of the legal system. The immigrants are expected to figure out how to rebut the government’s argument that they are inadmissible to or removable from the U.S. and get paperwork to show positive things like that they have completed school or have been rehabilitated. It’s nearly impossible to get any of these documents if you don’t have family on the outside helping you. Question: During your experiences at the Clinic and Immigrant Defenders, what are some of the challenges you have noticed that removal defense service providers are currently facing? Alda: Whatever policies the current administration implements trickle down into our immigration court. The types of clients we’re seeing has changed. Instead of individuals who are detained because they have committed crimes, we’re seeing the average father, who was just making ends meet and shouldn’t have even been on anyone’s radar, now getting picked up. We have a client right now who we assume was picked up for no reason other than racial profiling. We’re waiting to hear back on his case. Average, normal everyday people are being swept up and detained, and are having to go through this process even though they’ve been lawful, don’t have a record, and have been working and supporting their kids through college. It’s taking a toll on organizations, especially here in LA. We have such a huge immigrant population and we’re seeing an influx in people being detained or just looking for legal advice. There’s more need for removal defense immigration lawyers specifically. There’s a huge need for some kind of removal defense coalition. Question: Outside of court proceedings, what are some of the other ways the Clinic (and/or Immigrant Defenders) helps clients? Alda: This semester, I will help with one of two advocacy projects the Clinic is engaging in involving the border crisis. The one I’m helping with involves going out to different shelters in Mexico and then developing community education materials for them. So being able to have that international approach of partnering with Mexican non-profits who are doing the work at the grassroots level to educate people who are intending to cross over, whether it be through asylum or other means. The other one is similar but on the U.S. side of it. The idea is to interview people who have gone through the whole migrant journey —some of them who are currently detained— and try to identify patterns in how policies are being disseminated; who is being targeted, what does the process look like for people who are being detained. We’ll be producing a report at the end of it. Question: Do you think the LAJF-supported training you’ve received through the Clinic has shaped your understanding of the immigration landscape? If so, how? Alda: Before I started learning immigration law, I had this vague idea of what it is. I thought of it as a lot of applications and paperwork, but it’s actually one of the most diverse fields. You’re not just working with immigration courts, but also with state courts and criminal courts. There’s always going to be something new to learn. I think from a student perspective it’s so dynamic, but then it also means that in order to be a great advocate in that field you have to be exposed to a lot of different ways of thinking and systems. It’s not nearly as black and white as it seems. Question: What’s one thing you wish more people knew about the clients the LAJF providers serve? Alda: They’re human beings. Most of the time, these are people who are lawful, who have built a life here, who have raised kids here and are contributing to society as much as non-citizens are. Back when I was a community organizer, what struck me the most was that many of the people I worked with didn’t have papers but they put so much into the community; more so than I’ve ever seen most citizens put into their community. Immigrants in general enhance our community, enhance our society. When we have such divisive policies that are targeting and demonizing these people who are just trying to be their best, what we’re really doing is breaking families apart. We’re creating generations of people who don’t have faith in our legal system, don’t have faith in justice, or our government. There’s a reason why people try to seek asylum here, because there’s faith in our system. Right now that faith is being eroded. If your community is made up of a majority of immigrants, what kind of trust is that neighborhood or that city going to have in law enforcement? We’re breaking families apart and then acting like, ‘well they’ll get over it’ and that’s not the case; these are traumas that will pass down through generations. No matter what side of the issue you’re standing on, I think you can understand that trauma does affect the way you view and experience things. That’s something that as a society, we’re going to have to learn to manage. Question: How do you hope to make change in your community as a future immigration law attorney? Alda: I want to figure out a way to bring the community organizing aspect into immigration law; using that legal lens in order to mobilize communities at a grassroots level. We need a multi-faceted approach to these issues. Whether it’s collecting information to address policies or to build coalitions among nonprofits, I definitely want be on the ground doing the work with the community, with the families, with the ones facing removal and learning how to best support and empower those individuals. I think a lot of the battle does happen in the courtroom, but a lot of the trauma happens outside of the courtroom. Learning how to bridge those two worlds is really important to me, and as an attorney I hope that I’m able to find my place in that, trying to create social change while also representing the individual clients. To learn how you can support the work of immigration law attorneys and students like Alda through the L.A. Justice Fund, please visit calfund.org/LAJusticeFund.